“Communication consistently ranks among the top skills that employers seek” (Morreale & Pearson). The master’s program in communication further equips you with the communication and leadership skills necessary for a wide range of careers. You’ll explore and develop the communication skills necessary for professional success. Through practical experience and communication theory you’ll learn how to interact in various social situations and with a wide variety of people. The program prepares you to excel in organizational communication and gives you the tools to succeed wherever God leads you. All students pursuing the master of arts in communication are required to complete an interview. This interview is used to evaluate your background and determine your potential as a graduate student. BJU’s master of arts program in communication combines both academic and practical aspects into your studies. You’ll explore quantitative and qualitative research methodologies, and learn how to conduct both types within organizations. You’ll have the option to conduct traditional graduate research through an academic thesis, or participate in an applied graduate project, which gives you practical experience through the development of a consulting document for an organization that you’re working with. You’ll have the opportunity to choose from a variety of electives, including Nonverbal Communication, Intercultural Communication and Conflict Management, so that you can tailor your program to your research interests and professional goals. You’ll also gain an understanding of leadership, specifically in the areas of organizational culture, change and decision making. You’ll learn advanced principles of organizational communication and applied communication strategies for managers and executives. In addition, your studies at BJU will prepare you to be an effective communicator in every part of your life: career, family, local church and community. 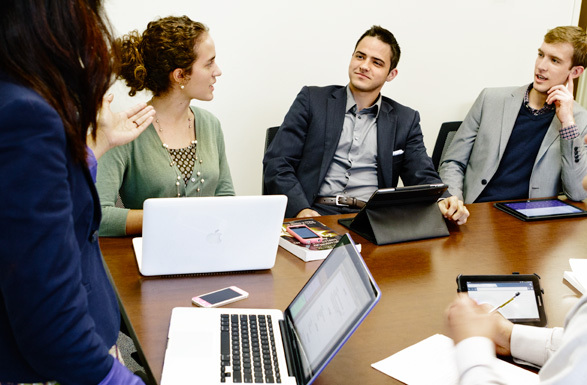 At BJU you’ll study under our highly qualified faculty, who have PhDs in the areas of communication and education. Their degrees are from a variety of institutions, including The University of Kansas, the University of Illinois at Urbana-Champaign, Southern Illinois University at Carbondale and Regent University. The faculty also have many years of experience in the corporate environment and have served as business consultants, trainers and mediators. In Assessment Methods in Communication, partner with a corporate client to conduct a communication audit, assess client strengths and weaknesses, and deliver an oral and written report of recommendations to the client. Throughout your time as a graduate student, you’ll have the opportunity to attend a number of conferences sponsored by the National Communication Association (NCA), the Southern States Communication Association (SSCA), and the Carolinas Communication Association (CCA). Past graduate students have presented their research at CCA. Design and execute a research project using appropriate research methodologies. Critique multiple theoretical perspectives of human communication. Evaluate communication practices in organizational contexts.